I mentioned some cool new outputs from IRC’s Ghana programme in my previous post. These factsheets present a rich picture of water services and their governance based on a total survey in our three Triple-S focus districts in Ghana. The fact sheets aren’t cool due to their content – which is actually rather depressing. What is cool is the technology used for the data collection, the way in which the indicators we used were developed, and the impact that the factsheets are having. 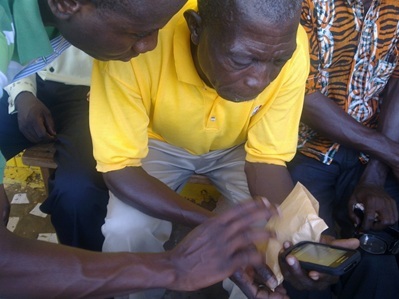 Mobile phone based technology: the technology is a modified version of Water for People’s – and now Akvo’s – FLOW Android mobile phone based system. Having read a lot about it, and seen impressive looking maps developed by WFP actually seeing the data coming in, in real time, in the Netherlands as our field teams collected it in Ghana – was still revelatory. For anyone who is non-digital native, or who has collected data the hard way, the wow factor is hard to understate. And no, I’m not unaware that there is more to monitoring than data collection. Yet as anyone who’s actually done it knows, the cost and effort involved in collecting the data, storing the data, transmitting the data …. all before trying to analyse the data (which subsequently turn out to have been incorrectly entered, stored etc. etc.) is a significant block to using the data. This technology (by which I mean cheap mobile phone based systems – rather than any particular flavour) is, as lots of other people said more eloquently than me, truly transformatory. Indicators based on national policy – closing the policy/practice loop. The second aspect of the work that I think is exciting is that the indicators used for the data collection draw directly on the standards and norms set out in Ghana’s national guidelines for rural water supply. They were developed by a working group from Ghana’s Community Water and Sanitation Agency together with IRC colleagues. By basing indicators – of both service delivery and governance – directly on the national guidelines, we are creating a direct feedback loop that will serve as a first step to making policy more evidence based – and in so doing help bridge the chronic gap between policy and practice. A gap that that has been identified as crucial block making progress in the Ghana WASH sector. Development of district water service delivery action plans by the three districts based on the findings – including some initial actions such as assessing and repairing broken down facilities by district assemblies. Triple-S will continue to track and support implantation of these plans. CWSA through a World Bank programme are planning to expand the use of service delivery indicators for baseline mapping in a further 66 districts. ← Allocation of funds for district level WASH programmes: What is the ideal formula?